I checked out Cooking with Sunshine from my local library recently, and today I decided to make “Campfire Dinners” on page 79. 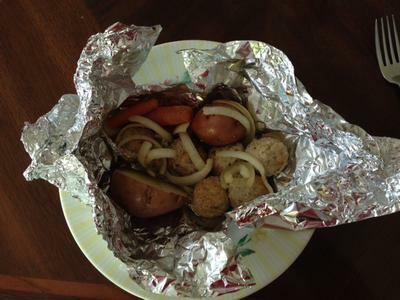 I prepared everything according to the recipe, and I placed them into the solar cooker around 2:30. The thermometer registered 275 degrees F when I put them in, but I fussed with the placement of the packs and then took a picture for this blog, so when it was all said and done, the dial had fallen by 25 degrees. It’s a fairly sunny day (high cirrus clouds only), so it should heat up again in no time. The recipe says to leave the packs in for 3 hours, so we should be on target for a 5:30 supper, although my meatballs were pre-cooked, not formed from raw meat. I will still allow the full time because the potatoes and carrots need to be tender, and that takes time! 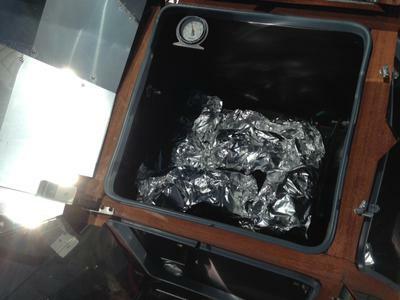 The oven got up to 325 degrees, but when I removed the packets, they were in the shade, and the oven’s temperature had fallen below 200. The packets were still piping hot, and everything was tasty. The carrots were still rather hard, and the potatoes could have used a bit more time, but they were at least edible. 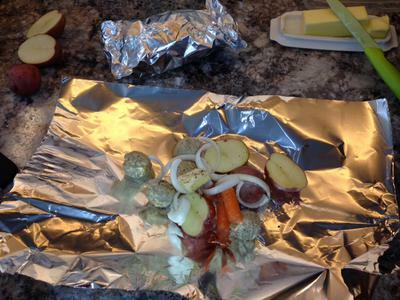 The food was in the oven for about 2 ½ hours. Three to maybe four hours might be a better time for this recipe. But everyone loved it, and we even have leftovers for tomorrow!